"a coherent cooling pattern across the Northern Hemisphere mid-latitudes that has emerged in the recent 15 years and is not reproduced by the models. This regional inconsistency between models and observations might be a key to understanding the recent hiatus in global mean temperature warming." "precisely identifying the mechanisms behind the observed regional cooling patterns in extreme cold temperatures lies beyond the scope of this paper." observational dataset and a large set of CMIP5 models. model realizations simulate a cooling trend in TNn. The discrepancy between recent observed and simulated trends in global mean surface temperature has provoked a debate about possible causes and implications for future climate change projections. However, little has been said in this discussion about observed and simulated trends in global temperature extremes. Here we assess trend patterns in temperature extremes and evaluate the consistency between observed and simulated temperature extremes over the past four decades (1971–2010) in comparison to the recent 15 years (1996–2010). 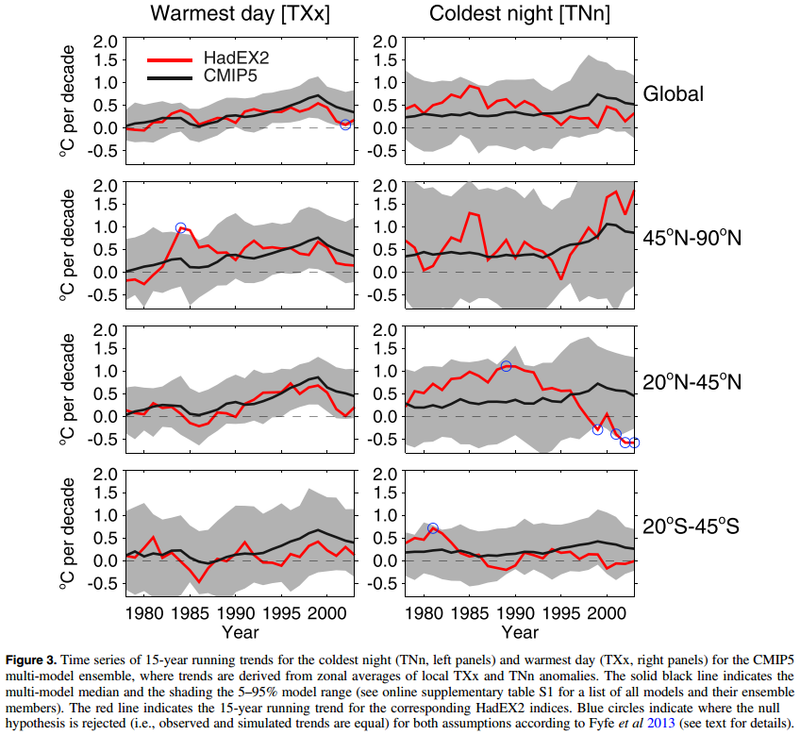 We consider the coldest night and warmest day in a year in the observational dataset HadEX2 and in the current generation of global climate models (CMIP5). In general, the observed trends fall within the simulated range of trends, with better consistency for the longer period. Spatial trend patterns differ for the warm and cold extremes, with the warm extremes showing continuous positive trends across the globe and the cold extremes exhibiting a coherent cooling pattern across the Northern Hemisphere mid-latitudes that has emerged in the recent 15 years and is not reproduced by the models. This regional inconsistency between models and observations might be a key to understanding the recent hiatus in global mean temperature warming. You mean to tell us that the climate "scientists" can't work out that it's not getting warmer because it's getting cooler. No wonder they're loosing the debate.